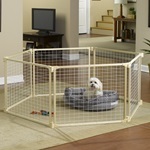 25% OFF ALL PET TRAVEL BARRIERS!! GET YOUR PET READY FOR VACATION TRAVELING THIS SUMMER!! LIMITED TIME OFFER!! 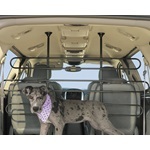 GMI® carries GuardMaster® and KeepSafe® Gates, Korrals, and PetShield® Travel Barrier pet products. "At Home and on the Road"®, GuardMaster®, KeepSafe® and PetShield® products have been keeping pets safe for over a decade. Choose from a wide assortment of styles and sizes. We offer Wire Mesh, Plastic Mesh, Wood Slat, Expansion gate styles in Standard, Tall and Extra Tall heights, and in Wide, Extra Wide and Super Wide widths. We offer Pressure Mounted gates, as well as Top of Stairs hardware mounted gates. In our PetShield® line we offer Wire Mesh barriers and tubular steel barriers for a variety of vehicles. We recommend that you measure your opening carefully before selecting your gate or barrier.